Oriental Rug Cleaning Atlanta. Do It Right. A Persian rug is a gorgeous addition to your home’s décor. Oriental rugs come in vibrant colors that accent furniture and have unique patterns that command attention, making them a popular conversation starter when used in the living room. However, and because of this, your rug needs to be taken care of specially. Hair, dirt, and dust are easily trapped within its fibers. While some of the debris can be eliminated by vacuuming them frequently, oriental rugs need to be thoroughly cleaned to ensure that they stay in pristine condition for years to come. What are the benefits of professional Atlanta Oriental rug cleaning service? Our service goes further than what you can achieve with your regular home stream cleaner or vacuum. The tools and equipment used are designed to clean and disinfect the rugs, ensuring that you and your family stays in hygienic environment all year round. Our equipment and cleaning solutions are certified by the Rug and Carpet institute. Online home vacuum cleaners, our portable steam cleaners, and truck mounted machines have super strong suction that ensures that even stubborn stains and deeply embedded dirt are cleaned out. Oriental rugs can harbor dirt, grime and even allergens introduced by people coming from outdoors. This makes professional service vital as it helps reduce the number of allergens in the air. Our professional carpet cleaning service maintains restores carpets to create a cozy, comfortable look and feel in any home. To maximize their lifespan, it is imperative that commercial facilities and residential homes have their carpets professionally cleaned on a regular basis. The service is designed to help keep your carpet protected from future stains and spills using a variety of methods. Regular cleaning only removes surface dust and dirt, leaving tones of grime embedded in the fibers of your oriental rug. It is therefore wise to have your rugs cleaned professionally once a year; but you may have to have rugs placed in high traffic areas cleaned out more frequently. Our equipment is powerful enough to remove invisible stains and dry contaminants that may otherwise reduce air quality in your house. To effectively clean your carpets at home, you’ll have to move the heavy furniture, vacuum them all by yourself, spot treat each one to remove individual stains, apply a pre-treatment solution, and cart the cleaning equipment away before you are done. Phew! All this can be rather time consuming and requires a lot of focus and effort. Use our professional oriental rug cleaning service in Atlanta. This will ensure that an experienced technician will take care of all these tasks, saving you time and a potential trip to the chiropractor. 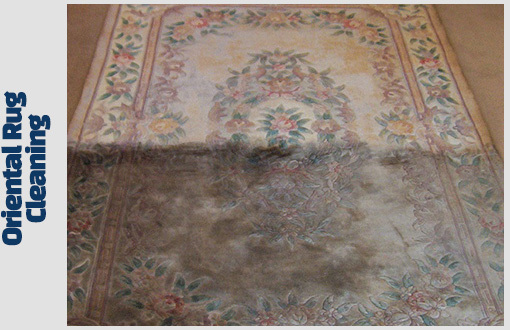 Oriental carpets can become vulnerable to mold and mildew when not cleaned properly or regularly enough. In many cases, they appear after someone attempts to clean carpets without professional help, leaving them wetter than they should be. Hire us to ensure that your carpets don’t become over-saturated and the dirt is properly extracted with industrial suction power. Our service is also designed to protect your oriental carpets from future stains and accidental spills. Ask about the specially manufactured cleaning agents that will be applied to your carpet to protect its fibers from wear and tear, in addition to spills and stains. We Don’t Just clean, We Restore Them! Even if you could find professional grade carpet cleaning equipment on your own, you might just ruin your lovely carpet accidentally. When not used properly, some cleaning machines can tear delicate fibers apart, resulting in small holes in your rug. Moreover, making the wrong choice of cleaning agent may cause colors to bleed, leave you with a faded, muted version of your once beautiful rug and possibly leaving the patterns incomprehensible. Not such a great conversation starter now, is it? Our professional cleaners have the requisite training to restore your rug to its original beauty while preserving the fibers. We have sufficient knowledge of the different kinds of carpets and will use the best possible cleaning methods and products for each carpet. Protect you rug from accidental damage and let a pro clean your carpet expertly in Atlanta.